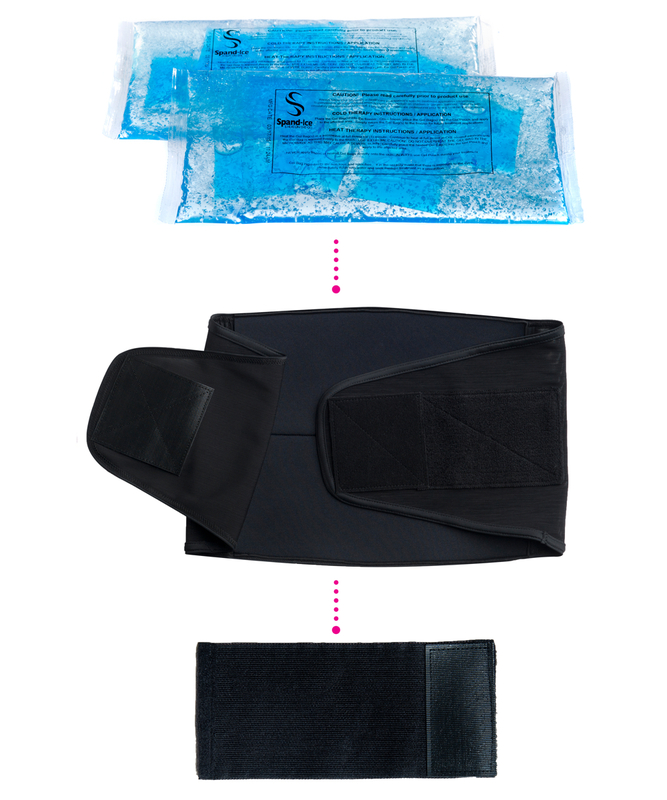 Postpartum Recovery Wrap: Ice / Heat Therapy, Compression + Support. 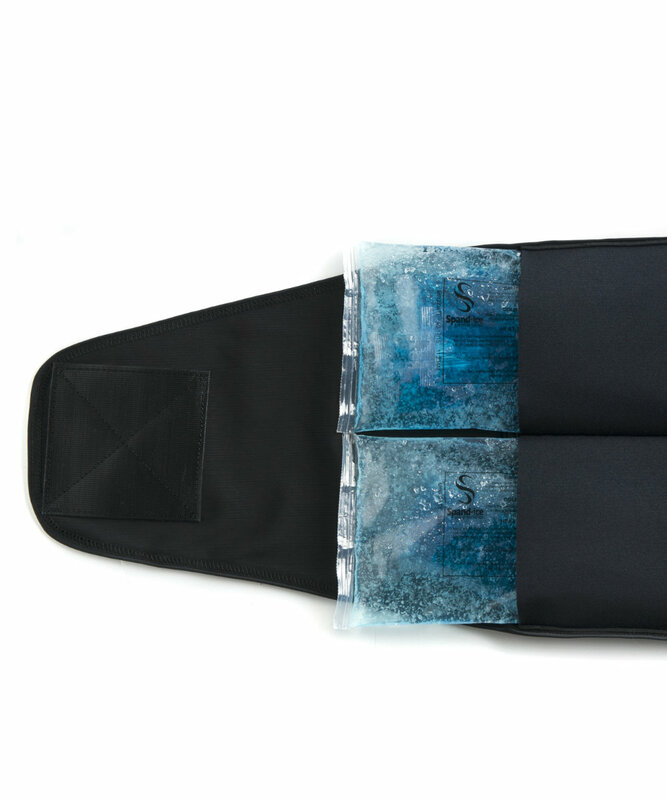 Reusable ice/heat therapy within a wrap for back pain, compression, support and childbirth recovery. 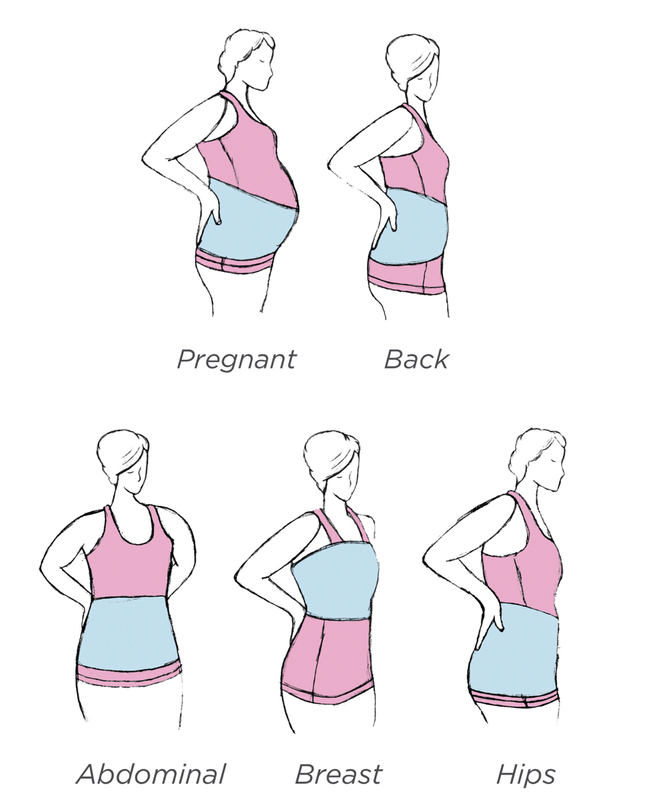 Use for back pain relief and belly support during pregnancy. 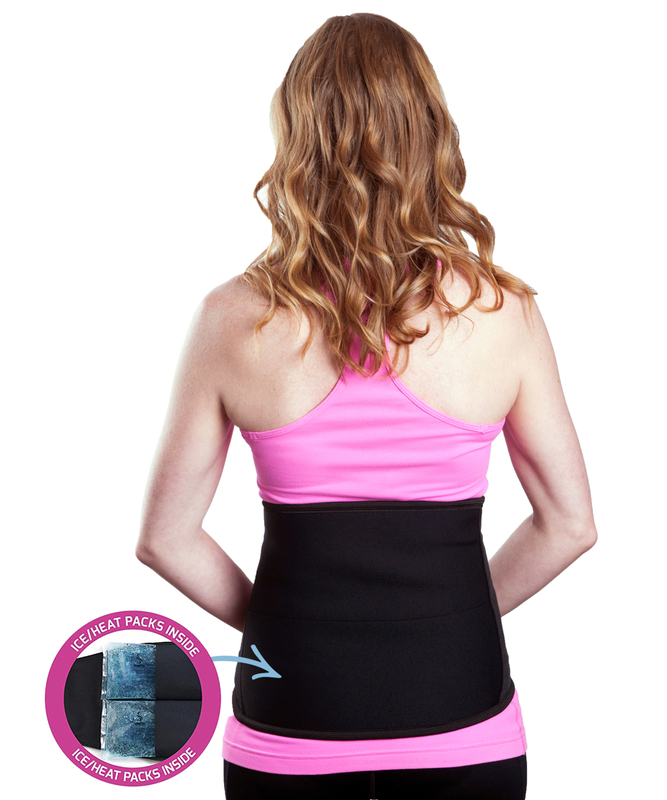 In postpartum recovery, use for back pain, light abdominal support, C-section recovery, mastitis and more. 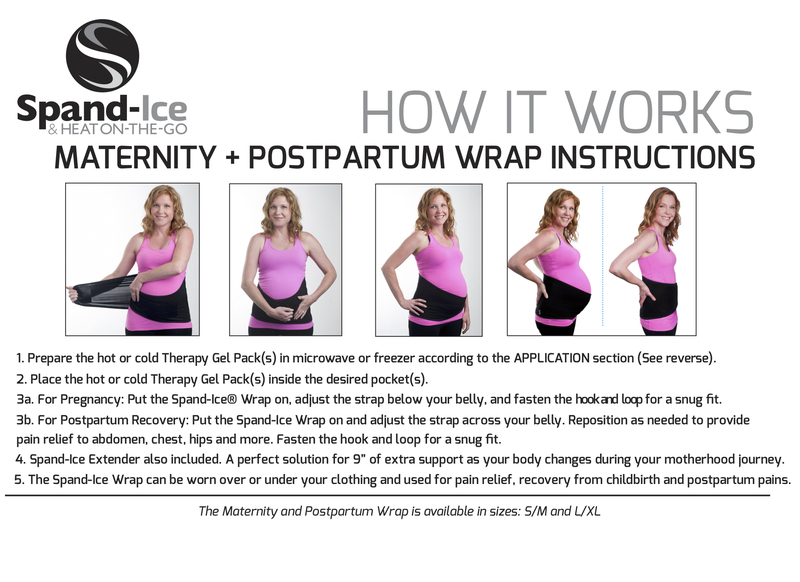 The Maternity + Postpartum 2 in 1 Wrap by Spand-Ice helps you to manage pain during pregnancy and recover quickly after giving birth to your new baby. 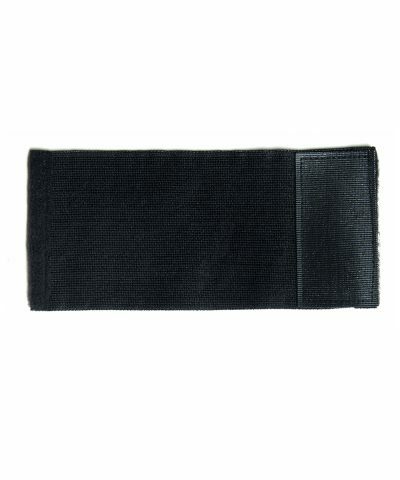 Using reusable ice/heat therapy with compression and support, we created the ultimate belly band for natural pain relief. As your body changes, this wrap does too. With 11″ of adjustability, it will fit snugly every time. PREGNANCY: Use for back pain relief, sciatica, belly support, posture aid, round ligament pain, and more. POSTPARTUM: Use for back pain relief, belly binding support, turn wrap around for C-section recovery, help with breast tenderness, mastitis, and more. Such an amazing tool to have during recovery. Not only has it helped with recovery if from a c-section but also helps me to feel stable and supported while taking care of a new baby and 4 year old. The material allows you to have flexibility but with the support that’s needed. I love the ice pockets. It keeps the ice packs from falling out and keeps them off my skin but still cold enough to work. The recovery process has been challenging with a c-section and complications but thanks to this wrap it’s helped to speed that process up and allowed me to do daily tasks with minimal pain. I’ve been using this postpartum recovery wrap for the past four months, and all I can say is: WOW!! This wrap is a complete life-changer. I went back to work just 2 weeks after giving birth to my son Anthony. But after I gave birth, I felt like many of my muscles just didn’t work the way they used to. Add to all of that the fact that I was suddenly carrying a growing baby in my arms, rather than in my belly, as well as dealing with back/abdominal pain and breast tenderness, and you’ll understand that I was pretty eager to find a solution to my postpartum pains. I decided to give this wrap a try at a friend’s recommendation, and I haven’t looked back since. I used to lie around for a good part of the evening icing my muscles after work, but this wrap has made it SO much easier to experience relief all day, no matter what position I’m in. It stays in place when I’m standing, sitting, getting to and from meetings, and even running. I started out using the wrap mostly for heat, but now I also use it to ice my back after a long run or a particularly hard day when my back is giving me a lot of trouble. The packs stay hot/cold for much longer than anything else I’ve tried, but my favorite thing is definitely how lightweight this wrap is! I forget that it’s on, and it’s so unnoticeable that I can wear it under my clothing without any issues. It’s helped me in so many ways, including allowing me to operate my business and get back into running again. I can’t recommend it highly enough to new moms! I’m in love with this wrap! Finally a way to ice while chasing my toddler. Plus I feel like the ice packs stay cold much longer than other ice packs. The wrap also stays in place and I don’t feel like I need to constantly adjust it. It’s comfortable to wear and I felt instant cold relief. I could only ice twice a day before owning this wrap when my daughter was sleeping, because let’s face it a toddler never lets you sit for at least 20 minutes to ice. My low back and hips are so grateful for this wrap. I wish I had it sooner. This wrap is awesome. Finally I’m not confined to sitting in a chair while icing my lower back. Definitely makes a difference with my chronic lower back pain. Thanks for a great product and super fast delivery. I ordered on a Monday and received it the next day! I LOVE this wrap! I kept seeing posts on Face Book and was so curious about it. Come to find out that Helen the owner/inventor of this product is a daughter of a family from my church. I just had to order one to give support to this hard working women! The reason I love this wrap is that I can multi-task. The other day I was moving boxes to my garage and the next day I was quite sore and still had to work. I was able to have the wrap on as I was cutting and coloring my clients hair and no one knew I had it on. It fit comfortable under my shirt. There is nothing else on the market that I have found to compare to this wrap. Thank you Helen I will be sure to tell all my friends to order the Spand- Ice! You out did yourself! God’s continued blessings on you new business venture. I love the recovery wrap. You can position it on the area needed, my lower, upper back, ribs The therapy packs are nice quality also. It is so helpful to be able to wear it and keep doing what you need to do. I just love this wrap. I have a severe back problems, and wearing this wrap helps me very much. I will probably wear this one out as I wear it all the time. The ice packs are so convenient to use too. I’m so glad my husband was watching TV the morning you were on, and he called me in to see this wrap. Thanks for inventing this. I have had trouble with my back for years and it was always a pain to get ice to the area. The ziplocks didn’t always work(tend to leak) and I tried other wraps, which fell off. This one is perfect because I can continue to work while wearing it and don’t have to lay around. Love it! So I made the mistake of trying to lift furniture this weekend. Apparently my lower back was not happy with that decision. Low and behold, I had a bad back for 3 straight days. That was until I used the Recovery Wrap. Within a matter of hours, my back was feeling almost back to normal! The product was super easy to use, just toss in the included icepacks and go about your business. The cold lasts for HOURS! Such a great product and made in the US to boot, can’t beat that! So I just put on my therapy wrap and thought I should definitely send you a message – I love this thing! It has been a life saver for me these past two months. If I didn’t have it right now I would be laying down in bed on a heating blanket getting absolutely NOTHING done! December was so crazy with my program launch, I didn’t have the luxury of laying down on the job. The recover wrap helped me stay focused on the work instead of my back/hip pain. I had a terrible low back spasm which I had never had before. I could barely walk or move. I went to the chiropractor which helped immediately. He advised icing my back. Someone suggested zip lock bags with ice cubes. Although I had an ice wrap from the drug store in the freezer somewhere, I was in too much pain and so restricted in movement I could not dig around to look for my ice pack. So I tried the ziplock bag method. Well it melted and leaked all over my clothes and my couch without my realizing it. The second time I flipped the first zip lock bag filled with ice over and put into a second zip lock bag. The same thing happened again. The next morning I visited the Spand-Ice designer for another purpose and I bought the Spand-ice wrap. It was a life saver. I was able to use the wrap for one more day of icing my back with no leaking problem. The following day I was able to return to babysitting and lift the 17 pound baby while wearing my Spand-Ice – this time using heat. It’s a great product that allows you to use cold or heat therapy as needed while being able to continue your activities instead of being stuck lying down the whole time. The cold or heat lasts longer than other methods such as drug store ice wraps or moist heat therapy wraps that you have to lie on and constantly get up to reheat in the microwave which is very difficult to do when you are in pain. The wrap is very comfortable to wear. I grew up in Pittsburgh, and my dad sent me a link to an article in the local Pittsburgh newspaper about this company. Always interested in new local businesses, I researched them and their products some more. I am a runner and like to do multi-day and ultra (anything over a marathon) distance races (and really, any runs!). I typically run five or six days a week. I also do Lagree pilates on the megaformer and hot yoga a few days a week, and like to walk commute to work and other places. I work as an attorney and spend a lot of hours in a chair all day. This all adds up to a very sore and stiff back and hips! So I ordered a wrap for myself to give it a try. I LOVED it. I am considering buying a second one so that when it’s cramping time I can wear one wrapped around my back and one wrapped the other way on my stomach at the same time! 🙂 I bought two extra packs to go with it and I keep two in the freezer and two out for heating. I love that I can wear it and then walk around and cook, clean, be on the phone, run errands, ride in the car, etc, all while wearing the belt. It also travels to far away races well. I liked it so much that I ordered one for a friend who just had back surgery (and she even used it the day before the surgery and loved it!) and one for my Dad who also has a lot of aches and pains. 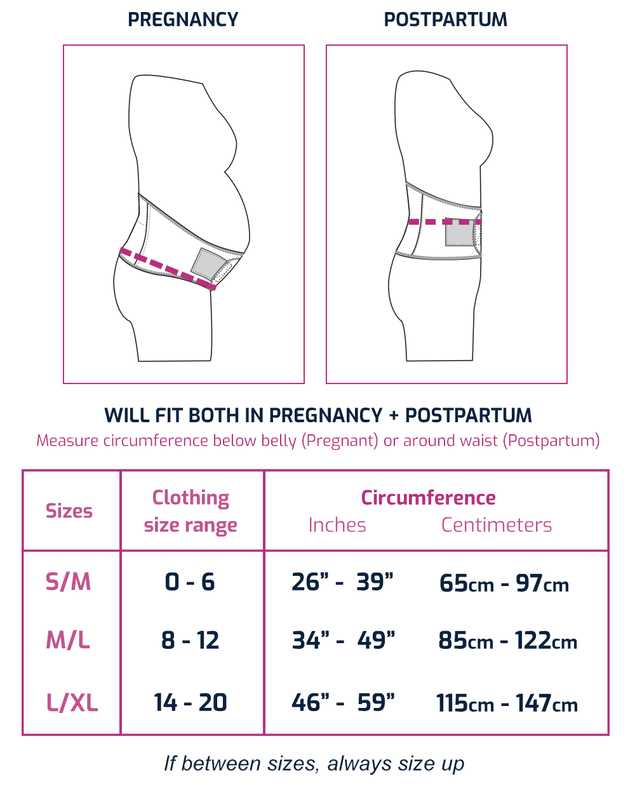 Sizing note, I am about 5’2″ and 117 pounds, my waist is bigger and my hips pretty narrow. The small/medium fits me, but not with much room to spare. My dad is about 5’7″ and 130 pounds, with a small waist and the small/medium did not fit him. So you might want to order up a size! I highly recommend one! I love wearing this after workouts. It’s so great to just strap it on and go about my business! My husband also loves using it for lower back pain. Thank goodness for the Recovery Wrap from Spand-Ice. After a recent accident at work I was told by my doctor to ice my back. However, I still needed to work, keep up after my 3 year old and go about my daily life. The wrap kept me adequately iced and able to carry on with my busy life. 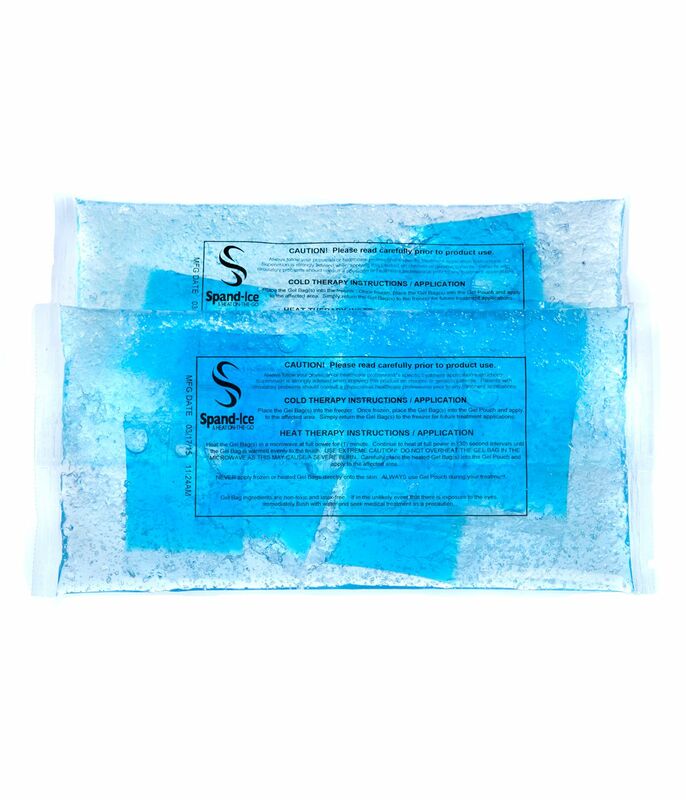 The ice/heat packs are like NOTHING else on the market! Took the pack out of the freezer at 2 and was still icing well past 5. These products saved my back (and my day)! If you have chronic pain you’d be a fool not to invest in these products!! I absolutely LOVE my wrap. I saw it a couple months back at a run and was seriously impressed, by both the wrap and the feel of the company. I finally bought one a couple weeks back and it has completely changed the game of my recovery (which I stink at). Usually, I am stuck lying in bed with ice packs and this drives me insane as I sit and think of all the things I need done. With the recovery wrap, I can do my favorite thing…multi-task. Plus, it covers a seriously large area. I would highly recommend to any athlete, or just anyone who has aches/pains. One stop recovery tool for hips, back, hamstrings and any other sore body part. 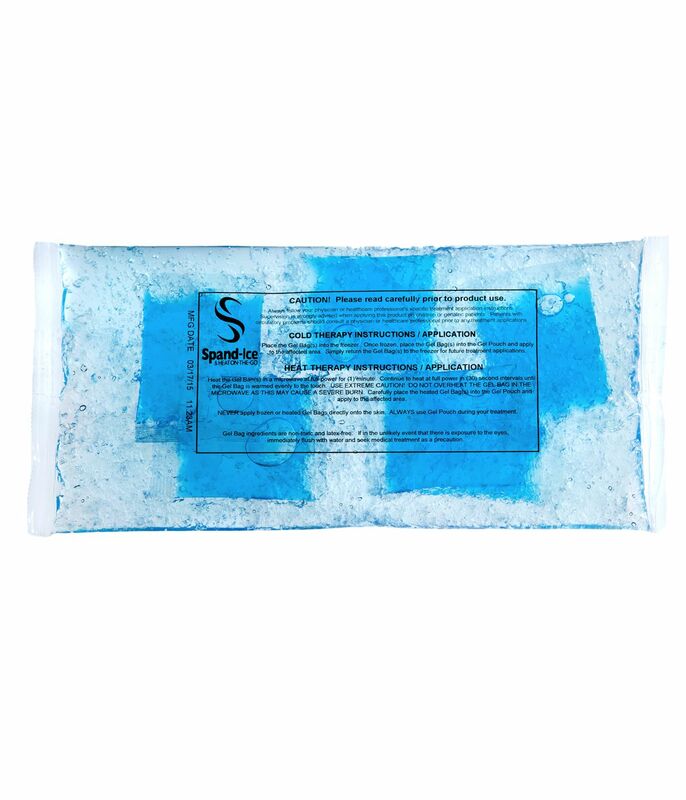 The hot/cold therapy component is a great way to save on muscle pain relief. Perfect for sore legs and hips after a long run or race.